Iraq has been making the news headlines for the last 20 years or so. In the early 1990s, the United States was forced to fight Iraq because they had invaded Kuwait. Originally, the war was simply called Desert Storm Operation, but little did they know that it would end up with a Highway of Death incident, which in turn would stop the war. The U.S., along with other 33 countries, formed a coalition that fought off the Iraqi troops. Since this took place in the Middle East, it had been named Desert Storm by the American troops. The entire operation was over when the Iraqi insurgents were trapped and stopped at the Highway of Death. 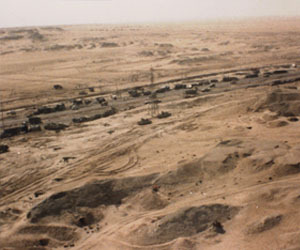 The eyes of the world had set on Iraq and Saddam Hussein when their troops started to patrol the Kuwaiti border. The U.S. Ambassador in Iraq was April Glaspie at the time, and she met with Hussein in order to discuss his intentions. The Iraqi troops had taken the Highway of Death (referred to as Highway 80 back then) heading towards the border with Kuwait, and their actions seem suspicious. When Glaspie met with Hussein, she allegedly stated the U.S. had no opinion on their conflict. The conflict she was referring to was the debt that Iraq had with Kuwait, and their disagreements in petroleum prices. Some say that this statement is what pushed Hussein to move forward with the invasion, and that's how Desert Storm got started. The coalition also had the approval from the United Nations, and they decided to move forward quickly, so they could stop the Iraqi insurgents from taking Kuwait. The Iraqis counted with helicopters, tanks, and entire troops. Even when they were attacked at the Highway of Death, it took the coalition ten hours to finally defeat them. On February 26, 2011, the Iraqi troops were supposed to take Highway 80 in order to return to their native country. The coalition forces knew they needed to be stopped, and they Desert Storm Master Plan consisted in closing off the highway so they would be trapped inside. With the help of aircrafts, they shut down the main highway and the attack began. The Iraqi forces didn't give up right away, but rather responded with fire. Thousands of insurgents and civilians jumped out of their vehicles and tried to leave the scene. This left a long trail of abandoned cars, which some were burnt and destroyed. After ten hours of intense battling, all you could see was the Highway of Death.